Recently, we observed the fifth anniversary of our arrival In Ascoli Piceno, Italy to take up residence. Prior to leaving our home of many years in the San Diego, California area, we started this Blog. Part of the motivation was to have a means of keeping something of a journal to reflect back on our experience. The other motivation was self-serving to the extent that it gave us a means to inform immediate family and close friends about what was going on without multiple reiterations. There have been some unanticipated benefits in the writing of this Blog. For me, it has developed as a more personal reflection on adapting to the life of an American couple becoming expatriates in Italy. What was also a pleasant surprise was the reaction of people we did not previously know, who contacted us with questions about our experience. The reality that the Internet provides a broad exposure to what one posts should have been obvious. The unintended fallout is we are delighted this Blog has turned out to be of interest to some others. I had set a goal of posting to the Blog at least monthly. One of the motivations emerged out of the process of attempting to gain a proficiency in a language outside of previous experience. In reality, at my stage of life, as much as I would wish otherwise, it will be some time – if ever, that I will be able to express myself in Italian with the nuance that I hope I can muster in the English language. Retrospectively, I have a sense that writing in the Blog has given me a vehicle to keep language and thought formation in my native tongue active through exercise. With the passing of time, there has been an increasing difficulty in setting aside time to write something for the Blog. The result has been greater gaps between postings. My sense is it is not a matter of having lost interest in the Blog but rather the gradual change that has taken place over the past five years as we are more fully taking on the role of being expatriates in Ascoli Piceno, Italy. After five years, if anything, we are even more committed to remaining residents here into the foreseeable future. We are somewhat surprised ourselves by the extent to which we feel ‘at home’ here. When we travel, we look forward to returning ‘home’ to Ascoli. While we have fond memories and maintain close relationships with family and friends in the United States but that seems separate from our feeling of where ‘home’ now is. A gradual change has taken place in how we perceive our adopted home. Our reaction to what initially seemed strange and new has gradually given way. While the sights, sounds and other sensations have not lost their fascination, what we see about us is now comfortably familiar. The pace of the days and the seasons has become pretty much second nature. Our responses to our logistical needs has become more relaxed in now having a better idea of where the resources are and being a little bit better at communicating with the service provider on the nature of our requests. We simply have become more comfortable here over the five-year span – and that is exactly what we had hoped for. Another change we notice is in perspective. In previous travels in Europe and elsewhere, we measured the experience from the perspective of Americans living in southern California. But now, our experiences are processed from a perspective of becoming more integrated into Italy as people who actually live there. A case in point; In June, we celebrated our 30th Wedding Anniversary by treating ourselves to two weeks in the Provence Region of southern France. We divided our time between Arles, the chateau Castel du Montboise’ and then on to Lyon. Many years earlier, we had a brief exposure to Provence and looked forward to going back. The recent trip was all we could have wished for. But we found ourselves having a different reaction to the experience than we anticipated. On our previous exposure, Provence was very different from the perspective of San Diego, California. We came back to Provence with expectations formed as San Diegans. On this recent trip, we were now experiencing Provence as people influenced by Italy. Seen from our new perspective, there were the now more familiar similarities with Italy in the scattered small villages surrounded by an active agriculture. There were the outlines of the vineyards, olive trees and the recognizable tanks, barrels and the other fixtures common to wine production that had become more familiar to us. But still we sensed a difference. Perhaps without realizing it, we were becoming somewhat provincialized Italians. We found it amusing to have a guide in Arles explain that Vincent Van Gogh was attracted to Arles because the scenery and the quality of the light reminded him of Italy. In various vineyards it was not uncommon to hear the cellar master make comparisons of their Rhone Valley vintages to Italian wines. And while we enjoyed the food offerings very much, by comparison to our experience of eating in Ascoli Piceno, Italian cuisine seemed to be subtler with delicate immediacy, freshness and simplicity. While innovative, the French cuisine struck us as somewhat overpowered particularly in heavy sauces. My apologies to our Francophile friends. We enjoyed France very much and will certainly go back but Italy has become the place where our heart is. Perhaps this is what is implied in the phrase – Having all the zeal of religious conversion. In a series of Blog postings since our arrival, it was natural to highlight events and celebrations that are part of the fabric of the place. As we have remarked so often, Italians in general and the Ascolani to our delight, display a sense of pride of place and community connectiveness. Annual pageants and events highlight the calendar and bring the community together in a celebration of who they collectively are. Early in the year, the celebration of Carnevale, more familiar to Americans as Mardi Gras, is a celebration of good natured, boisterous irreverence. During the summer, between late July and early August, the Quintana, a renaissance festival engages virtually the entire community in medieval contests in a setting of authentic, period costumes. Over 1,500 costumed citizens participate in a spectacle that rivals anything put on elsewhere in Italy. And then there are the purported observances on the liturgical calendar. The imprint of Roman Catholicism on Italy is unmistakable. But Italy has been showing signs of a great deal of secularization over the years and it seems, identifying oneself as ‘Catholic’ can be more of a cultural statement than one of absolute, devout religious conviction. It appears the religious days of observance seem to also provide one more mechanism to celebrate connectivity even if for some it only means walking into the church and almost immediately back out on the way to a large meal with family and friends. Then there are the local neighborhood celebrations and observances, the Sagra, originally honoring of the locally venerated Parish Saint but now featuring specific foods, entertainment and the connectivity the Ascolani of that neighborhood have with each other. 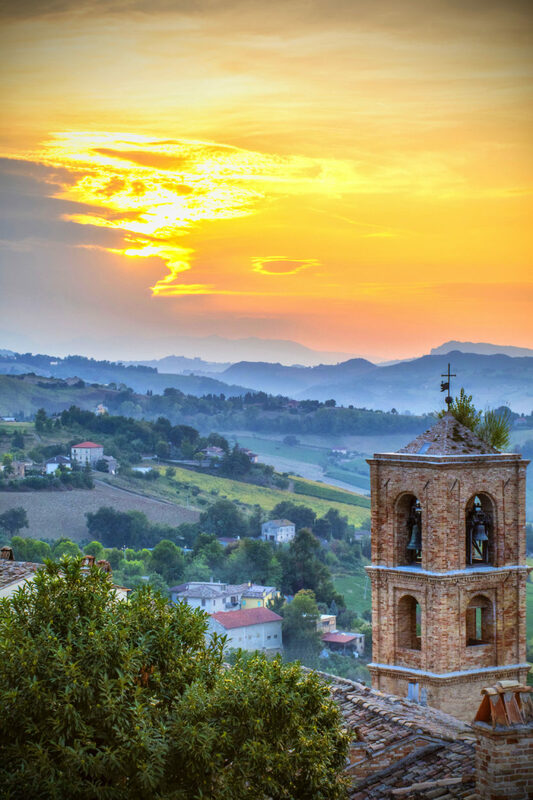 Add to that wine and food festivals in Ascoli itself as well as in the surrounding countryside. And then there is the ritual of the Passeggiata where citizens, young and old with their dogs, come together in the early evening to mingle and socialize. The main square of Ascoli seems more like a large, travertine marble living room. Italians stand in groups anywhere to interact and socialize. These are people who remain alive and vital through their associations and connectivity with others. As we have so often remarked, coming from the United States, where we feel an informal friendliness is part of the social fabric, here in Italy there is a more dynamic reality of a deeper sense of inter-connectivity that seems less vibrant in the land we are from. And part of the joy of being here is a sense of inclusion. A simple walk on an errand invariably turns into a social interaction. We continue to enjoy and participate in the near constant stream of community events, but I have been challenged to talk about these experiences in a fresh way without redundancy. Finding a new voice to celebrate these experiences is now a challenge for me. Another change has gradually occurred over the five years that has broadened our personal sense of community. Originally, we decided we did not want to gravitate to a place in Italy where there was a significant, English speaking, expatriate presence. We wanted to experience Italy with more immediate immersion. When we first arrived in Ascoli Piceno we had a sense there were few other Americans around. And there may have been other Americans hereabout, but it may be any who were here might have been doing what we wanted to do, be more integrated into the Italian community. Over the past five years, several other American couples have arrived to also live in Ascoli Piceno. In varying degrees, some have said they were partially influenced in their decisions to come to Ascoli by contact with us through the Blog. At this point, we have a small but very congenial group of English speakers who enjoy each other’s company but not at the expense of being part of a larger Italian experience. Perhaps, our now having an opportunity to have conversations of some depth and to share experiences in our native language has diminished a need to do that through writing. I have no way to really know but we have come to see these people as very good friends on whom we know we can rely in addition to a circle of caring Italians who regularly demonstrate their support and assistance. Photography is something I have enjoyed virtually my whole life. Having more time and such a wealth of subject matter in our new lives, has added to my enjoyment of photography. There are some images I might have shared on the Blog that I hadn’t gotten around to. Summer is a time to be outdoors, to enjoy our rented spot on the nearby Adriatic beach and above all, sitting on one of the squares with friends and enjoying a cool glass of wine. Some generous friends have encouraged me to do more posting of a few images and so I shall. I had a very unexpected affirmation not long ago when I was contacted by the University of Milan who were in process of publishing a book on the socio-economic consequences of the EXPO held in Milan in 2015. In doing their research, the University discovered photos I had posted on this Blog of our visit to the EXPO in 2015. The University requested my permission to use one of my photos in their pending publication. I was, of course, honored and granted the permission. To my delight and surprise the photo was used on the cover of the book with attribution. Perhaps a small contribution on our part to reciprocate for all that Italy is providing to us. Looking ahead, to our delight our oldest daughter and grandchildren have announced they are arriving here in Ascoli for the Christmas Holiday. We couldn’t be more excited as we enjoy sharing this place particularly with people we very much care about. In the coming year, two granddaughters will graduate university and then go on to Graduate School while the youngest grandsons will graduate high school. How did time pass so quickly? All the more reason to make the most of what time there is. Una delle più grandi gioie di Ascoli per noi è la vostra amicizia! Grazie per il vostro amore e apprezzamento per la città che tutti amiamo! Ringrazie tanto i nostri amici. Prego, vi ritorni subito! Your beautiful perspective made for a great read on a Sunday morning! Congratulations on the Milan cover pic. You are on the verge of being discovered! The only problem with you and Ascoli being found is that Rick Steves will soon be there, followed by all those buses full of American tourists – the very thing you wanted to avoid. I have such beautiful memories of you both, and of Ascoli. Thank you special friend of ours. We look forward to your next visit! We feel conflicted sometimes as Ascoli could use some tourist income but the place is charming because tourism has not ruined it. P.S. We have relocated from Naples FL back to our hometown of Va Beach VA. We miss Naples terribly but felt at this time in our lives we wanted/needed to be closer to both of our family members. We are “retired” although Al is seeking P/T work because he tends to get very restless not getting up and going to work. Whaaaaat??? Thank you Terri. We feel very fortunate both in our choices on where to be and in the choices on now long-standing friends. I’ve been waiting for the next installment of your blog, and you did not disappoint. Has the book on the Milan Expo been published yet? Be sure and post a photo of it when available. Glad everything continues to inspire and please you. Thank you Deborah for the encouragement. We responded directly with images of the book. Wow 5 years guys. I love reading your blog it’s wonderful. Thanks Grace and thanks for being one of our early points of connection to Ascoli. Well done Larry , great recap of you and Arlene’s five years in Ascoli. We are delighted to now be here experiencing Ascoli as you first did and finding it as wonderful as ever . After all the years connection by Email, it is a delight having you and Alfie a vibrant part of a community we all love. A personal resonse sent by Email. Has it been five years? What a wonderful recap of your observational experiences as expats in Ascoli. I keep thinking you are writing a book with this blog. Combined with your beautiful images, you could easily have the beginnings of a book. Then more readers would fall in love with Italy, just as you have. Thank you for sharing. Affirmation from someone so accomplished in the arts is an honor. Thanks Jennifer. A personal direct response sent by Email. Larry, you are an amazing writer! I very much enjoy your blogs and look forward to the next one. Many thanks Al.We have responded more personally with direct Email.